Relax and enjoy our little retreat villa in the Caribbean. Our first floor villa allows you to walk directly to the infinity edge pool or white sand beach from either the living room patio or master bedroom patio. Enjoy your morning coffee as you watch the sun rise over the Caribbean Sea. The second largest barrier reef in the world is right off our patio. Our completely remodeled villa has a large master bedroom suite with its own separate bathroom and patio/porch. The living area has a double size Murphy bed, large couch, dining table, full kitchen, full bathroom and patio/porch. These two areas are separated by a lockable door for privacy, making the space ideal for two couples or a couple with children. Caribbean Reef Villas is remotely located giving you a quiet and peaceful sanctuary in this Mexican paradise. The quaint fishing village of Puerto Morelos is only one mile to the north and the El Cid Resort and Marina is only one mile to the south. All within walking distance to restaurants and activities. The restaurants in Puerto Morelos offer excellent choices of cuisines from around the world with that authentic Mexican touch. A small grocery store and fresh seafood market is also available. You will find local dive shops, fishing tours, and snorkeling tours in town also. And of course, shopping at the local artisan shops. The town square is always bustling with activity. At the cab shack you can find a ride to anywhere. Snorkeling & Scuba Diving - The Great Mayan Barrier Reef located directly in front of the complex is the second largest reef in the world. The reef is home to lobsters, turtles, groupers, barracuda, dolphin, sting rays and a host of other colorful Caribbean fish. Cenote cavern diving in crystalline fresh water is just a short drive away. All the local dive shops offer scuba diving and snorkeling packages. Fishing - Charters can be caught at the world class El Cid Marina just down the beach or you can go into town and book a trip with the locals and enjoy Billfishing and light tackle fishing. Enjoying Puerto Morelos, MX with our family over Christmas & New Years. Scuba divers paradise - Beginner to Expert. Some of the best recreational scuba diving around. Many dive profiles to choose from such as shallow reef, deep water, drift, night, and cavern & cave diving in nearby cenotes. Cozemel wall diving is close by. Small 21 unit complex isolated south of town with a very quite beach. Very relaxing in the morning and evening drinking my coffee or cocktail by the pool. Full bathrooms with updated showers, toilets, and sinks. Granite top counters. Tiled walls. 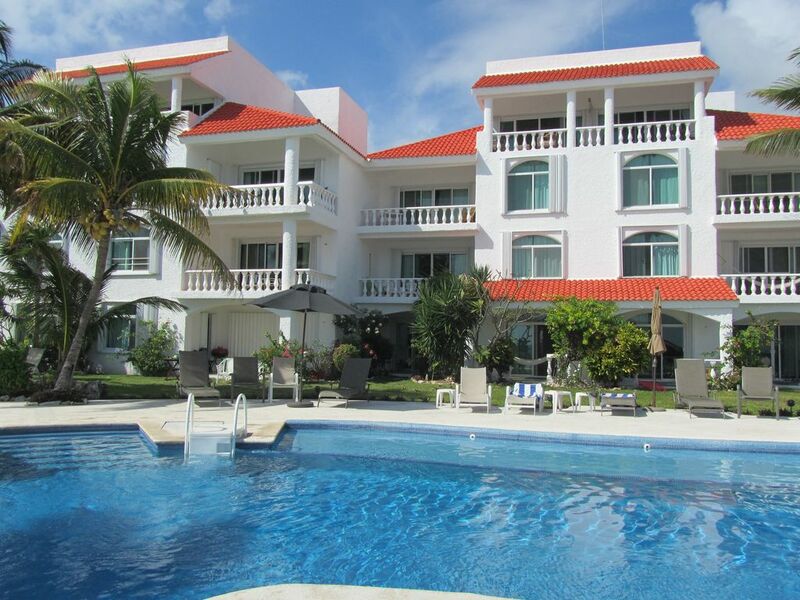 Walk directly out our 1st floor villa to the pool and beach. You are 80 feet from the beach and ocean. Multiple Palapas to shade yourself while lounging on the beach. Great views from villa patio doors looking out over infinity edge pool and Caribbean Sea. You can not get any closer to the ocean from a patio porch than our unit. Mexican cell phone in unit. Will need to add minutes with the purchase of a card. See property manager for details. Each room has an a/c mini-split inverter unit. Multiple Ceiling Fans throughout villa. Cooking essentials including spices and cooking oils. (2) One in Bedroom and One in Living area entertainment center. DVD & VHS players hooked up. Many movie titles available in unit. No TV station connection available - use for DVD & VHS movies only. More titles available in complex office library. A number of CDs are available. A number of DVDs are available. Beautiful grounds that add to your leisure experience. Infinity Edge pool overlooking Caribbean Sea and Mayan Riviera Beach Front. Property is away from the center of town, but is walkable. Figure approximately 1 mile or 1.2 kilometers. Taxis cabs are available to and from the town square. Call or visit the cab shack on the square to arrange rides anywhere. We have a Mexican pre-pay cell phone for use in our villa. Another wonderful stay at Jeff's place. The pictures do not do the condo Justice.if your looking for a beautiful condo this is it! Looking forward to are stay next march. Condo and grounds are beautiful. Perfectly equipped and very comfortable. We just spent 9 nights at Caribbean Reef Villas # 211. This is a beautifully appointed condo with wonderfully stocked kitchen with great appliances, a large patio with lovely furniture, 2 bedrooms and 2 bathrooms, and everything one could want for a wonderful break from the snow and cold of Minnesota. Although the beach is rocky with lots of the ongoing sargassum problem, the pool is wonderful, and we enjoyed many hours of poolside and Caribbean side relaxing and enjoying the wonderful seaside experience. We often walked into the fine little town of Puerto Morelos and enjoyed margaritas at Cantina Habenera and Don Ernestos. The new Super Chedraui gives you gourmet grocery shopping. and breakfast at El Nicho is always a treat. We also enjoyed meals at our condo with all we needed to make delicious breakfasts and delivered burgers from the very tasty Burger Underground. Don't miss the Wednesday market with homemade lasagna and delicious breads from the German baker. We have visited this area for five years and hope to continue our visits in years to come. Awesome, peaceful, restful vacation. Jeff’s place delivered as promised. Jeff’s place was beautiful, clean and functional. Ocean view right out the patio doors and steps away from the gorgeous pool. Lots of chairs, loungers and umbrellas. 20 minute walk along the beach to Delphinus where we swam with dolphins. A 20 minute walk along the road the other way takes you into the quaint town of Puerto Morelos where there are shops and many restaurants to enjoy. We made our breakfast and lunch at the condo and went out for dinner every night. A taxi to town is only 50 pesos and the taxi company is on What’sApp which works great. One afternoon the app wasn’t working so we stood at the end of the driveway and hailed a taxi within minutes. Overall a great experience and one of our most relaxing vacations. Snorkel directly in the ocean right outside our villa. Or you can take a trip through one of the operators in town and snorkel in the 2nd largest barrier reef in the world which you can see directly from our patio.